Eamon Dolan/Mariner Books, 9780544484078, 288pp. Deep is a voyage from the ocean’s surface to its darkest trenches, the most mysterious places on Earth. 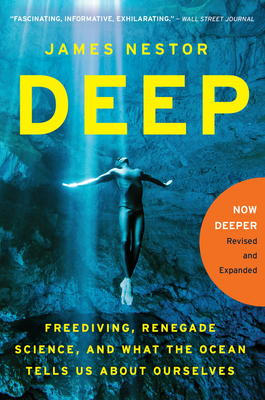 Fascinated by the sport of freediving—in which competitors descend great depths on a single breath—James Nestor embeds with a gang of oceangoing extreme athletes and renegade researchers. He finds whales that communicate with other whales hundreds of miles away, sharks that swim in unerringly straight lines through pitch-black waters, and other strange phenomena. Most illuminating of all, he learns that these abilities are reflected in our own remarkable, and often hidden, potential—including echolocation, directional sense, and the profound bodily changes humans undergo when underwater. Along the way, Nestor unlocks his own freediving skills as he communes with the pioneers who are expanding our definition of what is possible in the natural world, and in ourselves. JAMES NESTOR has written for Outside Magazine, Men's Journal, Dwell Magazine, the New York Times, San Francisco Magazine, Interior Design, the San Francisco Chronicle, and numerous other publications. His longform piece "Half-Safe," about the only around-the-world journey by land and sea in the same vehicle ever attempted (and completed), was published by The Atavist. Nestor lives in San Francisco and is a member of the San Francisco Writers' Grotto.